Back to the Future adventure game coming from TellTale Games! Back to the Future is easily one of my favorite trilogies, with part one as my #1 film. The little details and unique actors so perfectly captured within a charming storyline are why it remains one of my favorites. While parts two and three, in my opinion, don’t live up to the awesome-sauce that is the first movie, they served their purpose to give me MOAR BTTF goodness. When the third movie is wrapping up and the DeLorean is crushed into tiny bits, it’s kind of sad to know that the series was finally ending. My only other hope to get more BTTF would have been from the cartoon series that followed the Brown family, but I never watched it when I was younger. Game launch begins December for PC, Mac Also coming to PlayStation(R)3 computer entertainment system and iPad! SAN RAFAEL, CA. — October 25, 2010 — Telltale Games announced today the platforms, release month and pricing for Back To The Future: The Game. The PC and Mac versions are expected to burst out of the time space continuum in December, followed shortly by the arrival of the game on the PlayStation 3 system and iPad. • Telltale Games critically acclaimed Puzzle Agent — $9.95 value, available for download immediately after placing order. • For each pre-order of the series on PC and Mac from telltalegames.com, the company will donate $1.00 to the Michael J. Fox Foundation for Parkinson’s Research. Release dates and pricing for the PlayStation(R) 3 system and iPad versions of the game will be announced at a later date. Picking up shortly after the events of the third Back to the Future film, Marty and Doc embark on a completely new cinematic time-travel adventure. The story unfolds across five exciting episodes, with a new installment releasing each month. Telltale is creating the game in collaboration with Universal Partnerships & Licensing and film series’ co-creator/co-writer Bob Gale. 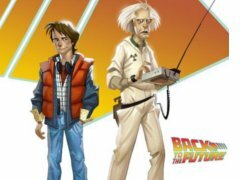 The games will release soon after the Blu-ray debut and DVD release of the Back to the Future 25th Anniversary Trilogy on October 26, featuring all-new restorations of the classic films. A special “making of” video feature is now posted at http://www.backtothefuturegame.com, with Bob Gale and the game team sharing an inside-look at the production. The video also shows first footage of Christopher Lloyd returning to the role of Doc Brown in the recording studio and talking about his experiences making the game. From the Academy Award(R)-winning filmmakers Steven Spielberg and Robert Zemeckis comes Back to the Future – the original, groundbreaking adventure that sparked one of the most successful trilogies ever! Starring Michael J. Fox and Christopher Lloyd, the phenomenally popular Back to the Future films literally changed the future of the adventure movie genre. Powered by innovative special effects, unforgettable songs and non-stop action, Back to the Future is an unrivaled adventure that stands the test of time. Back to the Future immerses you in all the breathtaking action, groundbreaking comedy and sheer movie-making magic of one of the most brilliantly inventive, wildly entertaining motion picture triumphs in Hollywood history! UP&L oversees Universal’s consumer product licensing, film and home entertainment promotions, and all corporate alliances for Universal’s theatrical, home entertainment, theme parks and stage productions. This dedicated division is also responsible for monetizing the studio’s vast library of films and characters through licensing, branding and marketing opportunities. UP&L is part of NBC Universal, one of the world’s leading media and entertainment companies in the development, production, and marketing of entertainment, news, and information to a global audience. Formed in May 2004 through the combining of NBC and Vivendi Universal Entertainment, NBC Universal owns and operates a valuable portfolio of news and entertainment networks, a premier motion picture company, significant television production operations, a leading television stations group, and world-renowned theme parks. NBC Universal is 80%-owned by General Electric, with 20% owned by Vivendi. Telltale is a leading independent digital publisher of cinematic adventures playable on every major gaming platform. Telltale is also the pioneer of episodic delivery of content developing games as series and successfully releasing on a schedule to create a longer consumer engagement for each release. Founded in 2004 by LucasArts veterans with decades of experience, Telltale has quickly become an industry leader, establishing the model for successful episodic game creation and digital publishing. Telltale has sold more than 5 million episodes since 2005. Telltale’s reputation for quality has been established across more than 35 published releases that have cumulatively earned an average Metacritic score above 80%. Telltale’s titles have won numerous awards including, “Adventure Game of the Year” accolades from publications such as IGN, PC Gamer, GameSpy, and Adventure Gamers, and have been recognized by mainstream outlets ranging from USA Today, to The New York Times to Variety. Telltale currently develops and publishes episodic series on the PlayStation 3 system, PC, Mac, Wii TM, Xbox 360 TM and iPad.